Avoid spinning wheels of death, lava pits and other dangers in this promising title from the studio behind Tiny Heroes. There appear to be two types of free-to-play games on mobile these days. One tasks you with building something (be it a kingdom, airport or city) and then gathering resources. The other is an endless runner that sends you through obstacle courses filled with hazards, where the goal is to collect loot and make upgrades. On that note, Simutronics' upcoming iPhone and iPad title, One Epic Knight, belongs in the latter category. 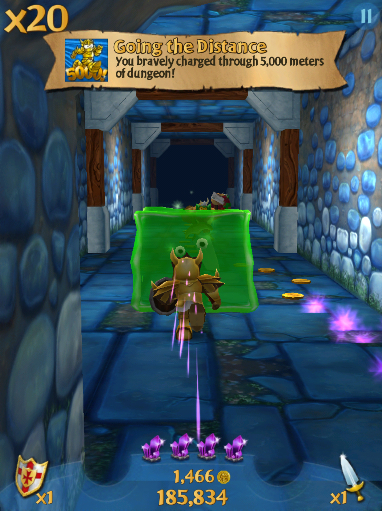 Set to debut August 23, this endless runner puts players in control of Epic Knight, as the armor-clad warrior plows through a dungeon maze while avoiding traps, lava pits and other dangers. Swords and shields make this game especially interesting, as these items come in handy for killing enemies and busting through objects, respectively. We don't often see this level of interaction in running games. Factor in upgrades, speed boosts, swipe controls and achievements, and One Epic Knight could be the runner that rules them all. We'll post a review next week.